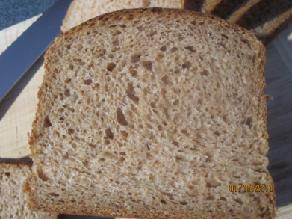 A while ago, I posted about how to make "shreddably soft" sourdough sandwich bread (see here). 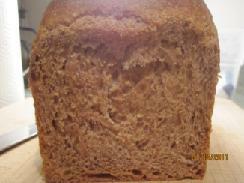 I got some questions regarding whether the same thing can be achieved with whole grain breads. Well, yes and no. The more whole grain flour there is in the dough, the lower the gluten is, so 100% whole grain breads won't be exactly AS SOFT AS the white flour one. However, with the right formula, and proper handling, 100% whole grain breads like this one CAN be very moist and soft - even shreddably so.This one is made using just sourdough starter, extra delicious when the rich flavor of ww is combined with the slight tang of sourdough. First of all, there needs to be enough ingredients in the formula to enrich and moist the crumb. This bread is adapted from my all time favorite whole grain bread book "Laurel's Kitchen Bread Book" , in addition to oil, honey, and sourdough levain, oatmeal is soaked in boiling water the night before to add moisture to the final dough, which contributes to the soft crumb. 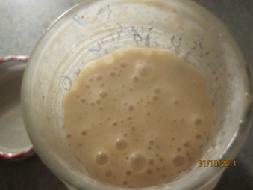 My adaption to the formula is to chagne the dry yeast to sourdough, and increased hydration a tiny bit. Secondly, ww doughs have lower gluten level, which means while you still have to knead it really well (to full developement), the windowpane you achieve won't be as strong as the white flour one. 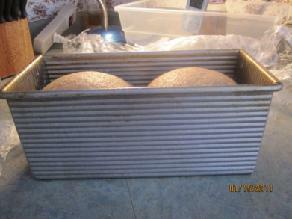 This also leads to a denser bread, which means for the same tin, you will need to add more dough to get the same volume. Since ww flour absorb more water, but absorb it slower, so it really helps to autolyse, and autolyse longer (40-60min) than for white doughs. It's easier to overknead a ww dough (in a mixer) too, so be very careful - for that reason, I usually finish kneading by hand. Thirdly, it's also easy to over fermentate ww doughs. I kept the levain ratio in this dough pretty low, and made sure when it's taken out of fridge for proofing, the temperature is relatively warm(~72F). I found if it takes too long for the dough to finish proofing (once I left it by the window, where it's only 68F, it took 10hours instead of 6 hours to finish proofing), the crumb gets rough, and the taste gets unpleansantly sour. Finally, the ww flour I used here is King Arthure WW, I have used other ww flour before, but KAF gives me the most consistent result. Note: total flour is 375g, fit a 8X4 loaf pan. For my Chinese small-ish pullman pan, I used 330g total flour. 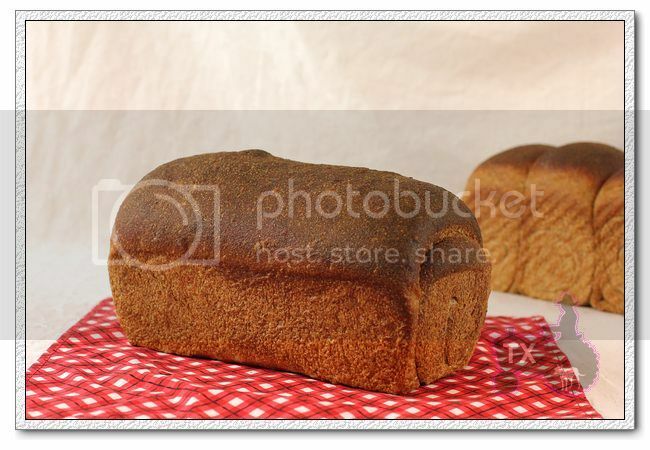 For KAF 13X4X4 pullman pan, I have not tried it myself, but I would suggest using about 600g of total flour. Obviously for pullman pans, you can bake with or without lid. 2. Mix and cover for 12 hours. 3. Mix together everything, autolyse for 40-60min.Knead until the gluten is very developed. This intensive kneading s the key to a soft crumb, and proper volume. The windowpane will be thin, but NOT as strong as one would get form a white flour dough. For more info on intensive kneading, see here. 4. Bulk rise at room temp (73F) for 2 hours, the dough would have expanded noticably, but not too much. Fold, and put in fridge overnight. 5. Divid and Rest for one hour. 6. Shape into sandwich loaves, the goal here is to get rid of all air bubles in the dough, and shape them very tightly and uniformly, this way the crumb of final breads would be even and velvety, with no unsightly holes. For different ways to shape (rolling once or twice, i.e. 3 piecing etc) see here. 7. Proof until the dough reaches one inch higher than the tin (for 8X4 inch tin), or 80% full (for pullman pan). About 6 hours at 72F. 8. Bake at 375F for 40-45min. Brush with butter when it's warm. Excellent ww flavor enhanced by sourdough, without any hint of bitterness. Stays soft and moist for days. Very nice TxFarmer! A great write up for some great loaves of bread. I was just going to look for a soft sandwich-and-roll type sourdough recipe. The son that has encouraged me to make sourdough isn't terribly fond of lean breads after all, and has requested some softer, more 'regular' type sourdough. Hopefully I'll get to this next week. 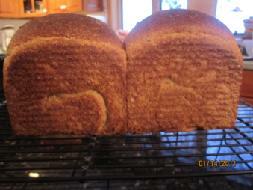 (Laurel's book was my inspiration and guide to making whole grain, high-rising breads years ago.) I'll have to read up on converting recipes to sourdough. I just love that book. Even though it written 40 years ago, the formulas and theories still work like a charm! Beautiful open crumb! I would love to taste your loaf, it looks tender and delicious! Thanks Sylvia, it's indeed a delicious ww loaf. 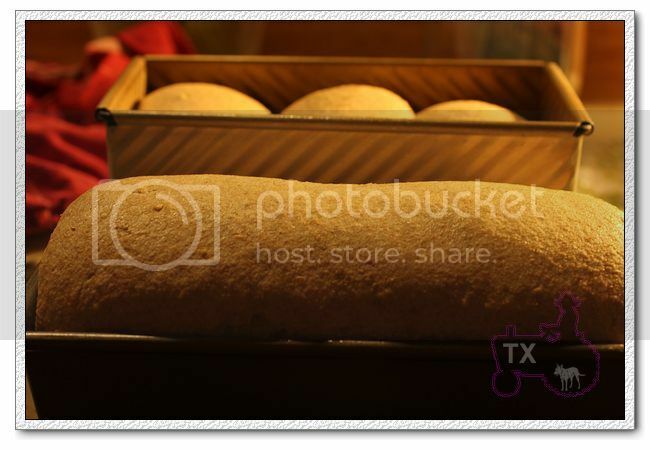 Nice loaves Txfarmer. In the ingredients for the final dough, did you run out of KAF WW? Can you clarify the "used half KAF". I don't quite understand? Sorry! It was a mistake (from cut & paste), should be "used KAF". This I GOT TO TRY! This is the great looking loaf, Txfarmer! It's really a gorgeous bread! Small problem: I don't like rolled oats. 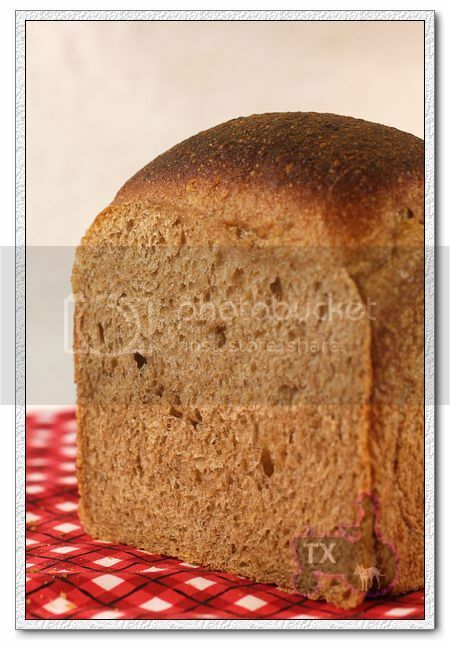 Do you believe that I could substitute it with rye flour or chops and obtain the same effect? Oatmeal porridge here provides excellent moisture to the crumb, I am not sure rye flour soaker would have the same effect. BTW, you can't taste oatmeal at all in the final bread, it melts into everything. Incredible! I knew it could be done! Hello txfarmer, thanks for all the good lessons in this post. 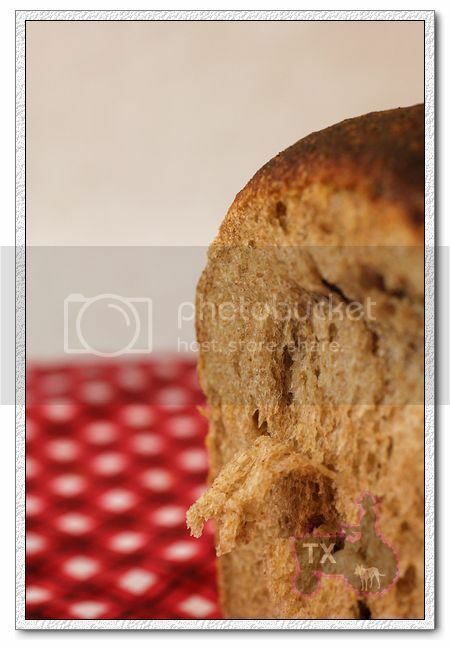 Your bread is perfect and the photography is great too - especially like the windowpane shot (a helpful visual). Great photos, you do such a good job with them! I am planning on trying this recipe soon, and appreciate all the good tips and good information. Thanks! Could you tell me why you proof the dough at lower temperature? You also keep the dough at 73F for the bulk fermentation. 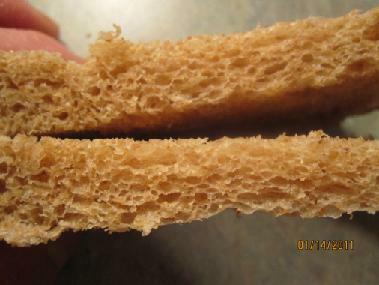 Your 100% whole wheat breads were very soft as much as I expected and it is not cakey crumb!!! GREAT!! So, I was little disappointed, but I continued to make your loaf. I let it rise until the dough reached up to 100% that was another mistakes. There are huge holes on the top of the loaf... But I am really pleased with this texture! It is very soft like white loaves. I tasted little tangy in the loaf the day that I baked but it was pleasant. Next day, the tangy flavor was weakened. 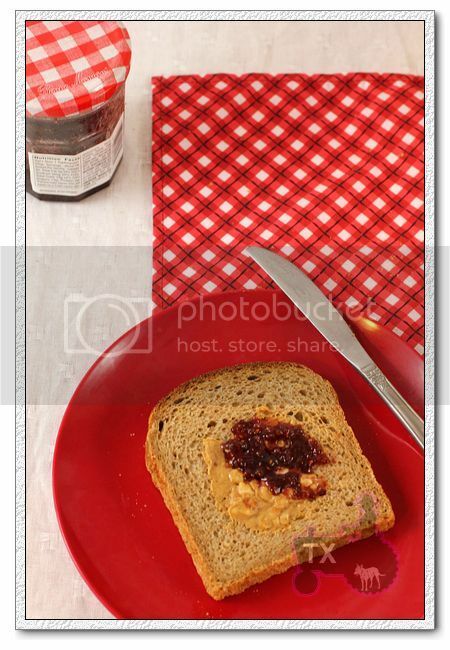 I enjoyed eating peanut butter and jelly sandwiches today. YUMMY!!! 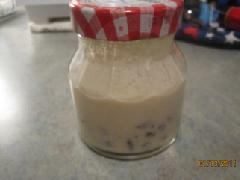 I made the same raisin yeast milk as soon as I made the mistake that I added KA AP in the rasin yeast milk that I made above. It is absolutely 100% whole wheat bread. I followed your instruction mostly. ( Let it rise at lower temp etc.. but I let the dough rise double in bulk for 4 hours for bulk fermentation instead of 2.5 hours ) Shouldn't I let it rise that much??? It is not as soft as the other one, but it is still very soft bread! It is not dense!! This is tangier than the other one. It will be milder tomorrow. I'd like to try this bread with rasin yeast WATER or yogurt yeast next time. Thank you so much, Txfarmer!! Yum! I made the oatmeal loaf (used white flour for levain though) without the retarding the fridge overnight. I just let it proof until it was an inch over the pan, about three hours. The kitchen is cold around here, so I let it proof in a slightly warmed oven, about 80 degrees. SO nice to know this works.... whole wheat, soft, and 100% sourdough. I didn't know until now it was possible! So glad that it worked well for you ! I just read this thread and am new here. 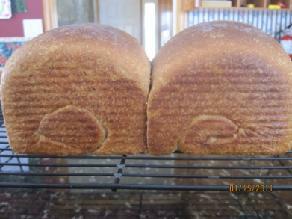 Your loaf reads a lot like the loaves I have been doing from Whole Grain Breads by Peter Reinhart. 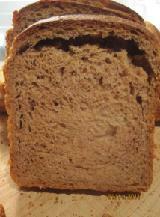 His recipes can all be used with commercial yeast or sourdough so it is much the same. They are all very soft too since he uses the soakers and bigas. I did borrow that book from library once, so I am speaking from memory here, might not be accurate. He does less kneading. Even for sandwich breads, I don't think he does such intensive kneading, which means his loaf is denser. If you check his yield, I bet for the same pan size, he uses more flour. Nothing wrong with that, a bread can certainly be soft and dense at the same time, as well as delicious, but I am after a "Asian style soft sandwich" here. 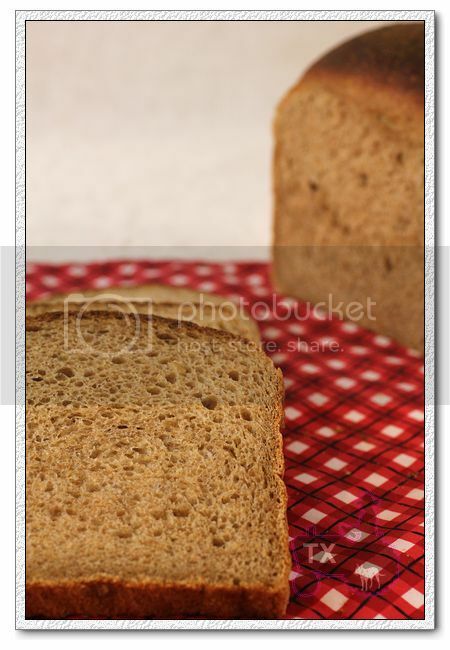 A different style - fluffier and lighter than average whole grain sandwich bread. 2: Better/deeper flavor. My sourdough starter is not that sour, so I like to fermentate longer to get the tang. 3: A fuller bulk rise usually results in a higher/bigger/fluffier sandwich bread, IF the kneading is done right. Again, here I am after a light Asian style bread here. I do understand the longer fermenting time = fuller flavor. Didn't realize that it contributes to a fluffier rise though. I have a Bosch mixer and with PRs doughs I rarely have to knead for more than 5 minutes before I get a good windowpane. I usually knead on the lowest setting only because I am afraid of overdoing it. I have once - didn't take long. I was intrigued by your final shaping. I usually handle the dough very gently at that point - firmly but gently so as not to loose all of the air trapped inside of it. I am curious to see what happens when I really flatten it out. The pictures you posted really helped me a lot. It is much easier for me to understand and grasp things when there are pictures along with descriptions. THank you for taking the time to go to all of that trouble. I am anxious to give your recipe a try. My daughter loves the soft loaves - my son likes the firmer ones so I get to do both which suits me just fine. On a side note - when I first started baking bread about 15 years ago when my children were young the only recipe I used was from Laurel's Kitchen. I loved that book and it was very unique at the time. Her ww bread recipes were the only ones I used to bake bread as I prefer not to use bread flours. I never looked for another recipe until I took up baking in ernest again about a year ago. It was then that I discovered PR's book and that Laurel had published bread book - which I have now too. 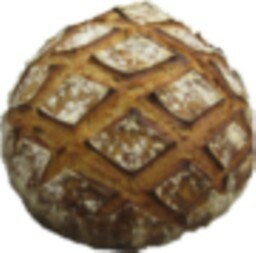 I now bake breads from many sources - some of which are on this site - yours is in my line up to be baked soon. For tomorrow I have a mash of mixed grains in progress that I will add to a soaker in the morning and see what results once it has baked. 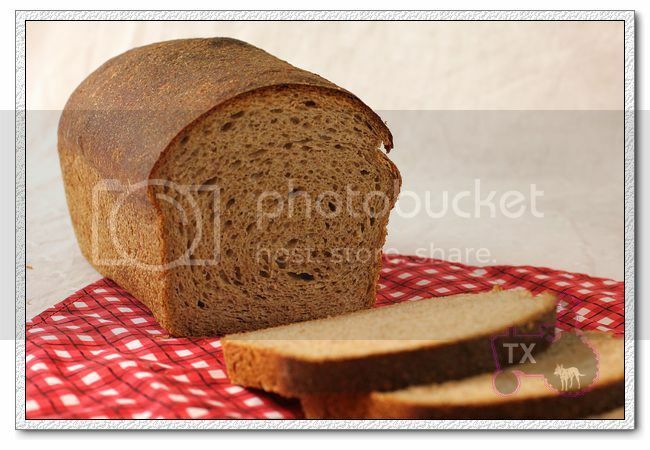 Shaping method depends on what kind of bread you want to make as well, just like every other procedure in baking. Here I am making a soft fluffy loaf, the crumb is similar to pan de mie, tight, even, "poreless", shreddable, which is why I want to get rid of any air bubbles inside during shaping. When I made country loaves, baguettes, then I want to be gentle during shaping, but still maintain tight surface tension. Different handling creates different results, so different breads demands different handling in fermentation, kneading, and shaping/baking. Thanks for the explanation. I have lots to learn. Today I did do the extended kneading you outlined above and watched the dough very carefully so as not to end up with goo from too much kneading. Final loaf was indeed very soft and moist and naturally sweet due to the mash. It passed my daughter's taste test with a this is 'great'. As I said your bread was on my list to try. I started it yesterday and will post pictures here if I can get it to work...I am new to this so please bear with me. I have several more questions for you now that I have used your recipe. Again, I will be referencing PR as his are the only recipes that use the method you have used and I am curious as to why certain things are done differently. 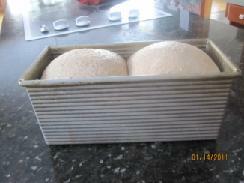 I began these loaves yesterday morning at about 9 AM. First thing that struck me was how little starter you use in your recipe. I was afraid it wouldn't work since the recipes I have been doing with PR's breads use 4x as much starter...They start with 64g of starter and then he adds about 190g of flour and 140g of water. For the soaker I used steel cut oats instead of oatmeal. I am used to a soaked grain 'soaker' but your recipe again used a smaller amount of ingredients than I am used to. Your recipe stated that they had to sit for 12 hours...I cut that short because it would have been late at night and I knew I had several more hours to go once they were added to the final ingredients. I mixed them with the final ingredients at about 7 PM. The starter was ripe and ready to go. The oats had absorbed all their water so I knew they were okay too. I know you are not familiar with his breads and I am asking these questions so I can learn how to make up my own recipes like you have done. How did you decide how much flour and water to add to the final dough? Why didn't you just use more flour and water in your levain? Anyway, I let it sit out for an hour as you suggested and then I shaped it using your pullman technique....rolling out 2x. It really made nice firm shapes - not like I have ever been able to achieve before. My loaves only took 3 hours to proof compared to your 6 hours. My house was about 73*. I figure maybe the altitude caused the rise to be faster...I don't know. I preheated my oven to 400*. Popped them in and let them bake at that temp. for 10 minutes and then I lowered the temp. to 360*. I rotated both loaves after about 20 minutes of baking time since my oven is warmer on one side..
Now I will try to post my pictures. First will be when they first came out of the oven. I baked them in cast iron pans. And now a shot of them out of their pans. You can see how the slashed loaf rose higher than the unslashed one. Here is a shot of the slashed loaf. and then one of the crumb. Thank you for posting your recipe and all of the pictures. They help me very much. A picture IS worth a thousand words! I use small amount of starter, and more flour/water in the final dough because I want the bulk rise and final rise to be long, to 1) fit my schedule, I find it's eaiser if I split things up into 2 days; 2) generate a tangier taste which we like. I don't know how long PR's formula takes to rise, if he use that much starter, and so little flour/water in the final dough, I am guessing it'd be much faster. A lot of people would be afraid if a small amount of starter is used, the dough won't rise, which is not true, if the starter is activev and healthy, yeast would multiply at an exponential rate. As long as it's not so slow that the dough gluten is destroyed by protease (usually 2, 3 days are very OK), it will rise just fine. How do you time your loaves? You wrote a 12 hour rest for your levian and soaker. That is all day and then the extra rising time when everything is added. Do you make it a long, late day when you do this? PR uses the 2 pre doughs - a soaker and a biga that sit out overnight. BIga in the refrigerator and soaker on the counter. Both can be held 12 to 24 hours before use to fit ones schedule. The final ingredients - extra salt, extra yeast,(He uses only part of the salt and yeast in the 2 pre-ferments) sweetener and a bit more flour are all added the following morning and then ferment for only 1 to 1 1/2 hours before being shaped and proofed. Proofing time is usually half the ferment time. The loaves have lots of flavor due to the time they were sitting out before being mixed with the final ingredients. I was indeed very surprised by how well the starter worked. I will use your amounts again as I have had trouble trying to retard other loaves....they always over-fermented even when in the refrigerator. Now I know it was just due to using too much starter even though that is what the recipe called for. I did not find that using the lesser amount increased the rise time at all. In fact, as I stated above, the final proof was only 3 hours! One long day? I purposely design the flow so that I don't have to do everything in one day. Mine proof in 5 hours when it's warm. But if I can find a cool spot in the house, I can stretch it to 6 hours, which means I can let it rise when I sleep, so the schedule can be: work day evening make levain, next work day morning mix dough + 2 hours of bulk rise+ put in fridge, that same evening before bed divide + proof, 6 hours later (i.e. the next morning) bake. Thank you for the outline. That is what was confusing me. That makes a long day and late night waiting for the bulk rise. Now it makes more sense. The loaf is nearly gone. A huge success here! You do need that hour of autolyse though, which means if I prepare the levain at 6am (early riser here), get home from work at 6:30pm to start the process the same night, it's one hour of autolyse + kneading for ...approx. 30min + 2 hours of bulk rise = 3.5 hours, I will be done by 10pm, which is exactly my bed time. Not really a "late night"? With the exception of the 30 mins of kneading, the rest are just idle time, during which I can eat dinner and spend time with my family. On work days, I am only at home (and awake) for <3 hours in the morning and 3.5 hours at night. This schedule allows me to use these time efficiently. If I follow PR's method, the whole process is shorter (in 4 to 5 hours? ), but I simply don't have 4 to 5 hours in one stretch on weekdays, not even during weekends actually. Since last year a whole new world has opened up to me. Somehow I stumbled across PRs book and began using his method. In the last couple of months I have been 'branching' out and trying to gain more understanding to this whole process. I am a slow learner and learn by doing. Now that I have done your method I can see the similarities and know a bit more about retarding dough to bake later. Your method does make a lot of sense when time is crunched like your schedule. His method could very easily be adapted to your way of baking.The bulk fermentation could be done overnight in the refrig just like yours. After doing your method I can see how it could work with his recipes too. Just hadn't figured that out on my own yet. I will try it out to see what happens. It is fun to learn new ways of doing things. Being able to retard dough opens up a whole new arena for me to explore. There always seems to be something new to learn. I never knew this could be so detailed! This is the first loaf I've tried making anything with my whole wheat sourdough starter. Followed the directions almost to the letter -- unfortunately once put in the pan I couldn't get the loaves to rise. I gave it a 12 hour rise at room temperature and they still barely cleared the top of the pan. I baked it anyway (just so it wouldn't go to waste; I'm a fairly new baker and I'm always concerned about new experiments going to waste). The bread, although super dense, has an incredible flavor; almost like there was vinegar added to the dough. I sort of like it, but I'm not sure how it's going to go over with the rest of the family! Thank you for the illustration on the technique. Perhaps I'll work harder to get a white sourdough sandwich loaf that is successful before I just righ tinto ww. 1) The ww flour you use may not have enough gluten. I use KAF ww flour with very consistent results. 2) Is your starter active? Did the preferment double even triple? 3) Did you knead as specified? Did the dough pass windowpane test? 4) Did the dough at least double at the end of bulk rise (after retarding in the fridge)? If not, your starter may not be active enough. Thank you so much for taking the time to troubleshoot! It is much appreciated. 1. I use ww flour from my local food co-op which has a lovely flavor but unfortunately I can't speak to the gluten content. I augmented the preferment with additional vital wheat gluten (since this step did call for ww bread flour specifically), but should have probably done this throughout. 4. No, the dough did not double at the end of the bulk rise. Which leads me to definitely think my starter must not have been active enough (I'll poke around the site to see if there are good ways to "jumpstart" a starter, so to speak) and potentially that the rising environment was not good (my house is pretty cool). Also, I was very nervous that my dough may have also been too wet. During the kneading it seemed very sticky and never really came together -- I had to add a lot more flour for it to really come together. Too wet is rarely a problem, it may be harder to knead, but you have a KA, that shouldn't be a problem. From the sound of it the dough/flour lacks gluten. I would suguest you to buy a bag of KAF ww flour, try it out, and see how a dough should feel, then try to adapt to your local flour. BTW, 20min on 3 is a looooooooog time to knead, especially a ww dough. Mine would've been way overkneaded into a puddle in that time. For some reason this dough is runnier than a 100% hydration whole wheat dough I made recently. I was able to achieve a nice windowpane during kneading but now on the 2nd day I'm not able to shape it like in the pictures. It's more like the consistency of a thick pancake batter. I tried to shape it using a dough scraper but it fell apart when transferring to the baking pan. I'm after a soft bread but I'm concerned this is a bit over hydrated and difficult to deal with. So, if I decided to use 600 grams of whole wheat flour for the Pullman loaf. Do I just use 48 grams in the levian, and the rest of the 552 grams in the final loaf and dusting the counter? Do I need to make adjustments in water or anything else? if anyone knows, please let me know. Thanks.